I’ve been told over the years that I’m pretty good at finding jobs. I mean in the last 25 years and 15 jobs or so (some contract positions) I’ve never been out of work for more than a month and a half at a time. I’ve always thought the methods I use were pretty common and in fact common sense. But several of my younger relatives (20’s and 30’s) seem to have a hard time with it and in my opinion do some rather strange things while looking for a job. As a result of this I thought I would share the process I take while finding a job. I want to say up front this is just one way to do it. It isn’t necessarily the only or even the best way. It’s what works for me. You’ve just been told it’s time for you to move on. Your position has been eliminated. You’ve been down sized. There is in fact, no reason for you to continue to show up at this particular office. What do you do now? Let’s start with attitude. This is probably the most important part of the whole thing. Finding a job is a JOB. This means that whatever effort you would put into working at your job (if not more) should be spent finding the next one. You want to make it as easy for recruiters and potential employers to find you, and when they do find you it would be nice if you had something to give them. So getting your paperwork done early is important. This would be your resume, your contact lists, maybe even an outline or two for cover sheets. Once your regular resume is ready you should also get signed up on whatever job sites you can find (making it easy for potential employers to find you). Dice and Monster are good places to start. Sign up, fill out your profile, and let people know you’re on the market. The chances of getting a job this way aren’t the greatest in the world but every little bit helps. You will also want to put the word out on social media. Facebook, Twitter etc. Also if you aren’t on Linkedin it’s a little bit late for it to do much for this job search but sign up anyway and add all of your (now ex) co-workers. If you are already on Linkedin get your profile complete and up to date and add all of your (now ex) co-workers. Web sites for searching for jobs have taken the place (mostly) of help wanted ads in newspapers. (If you don’t know what a newspaper is ask your parents.) These web sites will have thousands of possible jobs for you to search through. Make a list of any of these sites you can think of (Dice, Monster etc) and continue to search for more. Then the first thing you do each morning is go through all of the sites on your list and see if any new jobs have turned up. Mark down any jobs you find until you are done with your searching. Frequently you will find the same job listed on multiple sites and possibly even through multiple recruiters. You will want to make sure that you only apply once for each job. It’s a waste of time to call on the same job multiple times. Recruiters are a fact of life in the technology industry. If you have a list of recruiters that you’ve worked with before now is a good time to find it. If you don’t have one you will shortly. 90% or more of all jobs I find on the various job sites are “recruiter jobs”. So when I call on a job I like it generally comes with a recruiter attached. Once I have the recruiter’s name they go on the list. I call everyone (yes everyone) on that list once a week. Not all on the same day, I split them up so that I’m calling about 1/5th each day. The purpose of the call isn’t just to see if they have a job for me, but to check on any existing jobs I may have with them and to make sure they don’t forget me. Remember these people talk to hundreds of people. Their job is to remember people, but even so it has to be hard. Put yourself out there, make yourself noticed. I’ve done all of that and I still have 6 hours left in my day. Remember at the beginning I said that you should put in a full day finding a job? Well searching job sites and calling recruiters doesn’t really take all that long once you get going. So what are you going to do for the rest of your day? You could hit the pavement. Stop by every office you think might have a job for you and ask to talk to HR. Not my favorite thing to do but it works sometimes. Start/continue to develop an on-line presence. Employers like to look at what you have done on-line these days. 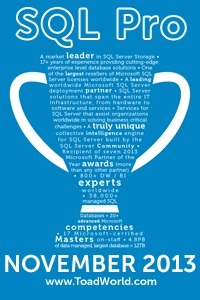 Answer questions on a forum, start a blog, answer questions on twitter (#sqlhelp), etc. Study. Gosh with a name like SQLStudent I’m going suggest you spend some time studying. Shocking I know. But now is a good time to touch up your existing skills and/or study something you haven’t had time to work on yet. Personally I find certifications make for a good course of study but that’s certainly up to you. Maybe now is a good time to finally learn Powershell, or brush up on windowing functions. You would be amazed at how much free study material there is out there. Practice your interview skills. Yes interviewing is a skill, and yes you can get better at it. Do a bit of bingoogleing and you can find dozens of blogs and articles with titles like “Top 10 interview questions and how to answer them.” If you have some money to spare now might be a good time to take a class on interviewing. Brent Ozar Unlimited has one that is supposed to be pretty good. Just ask Doug Lane (b/t). You finally have an interview! *whew* All done right? (This is one of those attitudes that drives me nuts.) Unless you are like my wife (who has never had an interview that didn’t result in a solid job offer) you need to keep going. Schedule your interview, fit it in among the rest of your work, and keep going. Heck, you might even keep looking for a little bit after you get a job offer. There is always the chance it will fall through at the last minute. An interview, even if it went great, is no excuse to stop working. The only suggestion I’m going to give you about the interview itself is one my wife always gives me. Tell them you want the job! “This sounds like a great job. I’m really excited about it. I’d love to work here.” Sounds simple but you would be surprised how often interviewees don’t do it. At my peak I’m usually calling 20+ recruiters every week, sending out 1-2 resumes a day and interviewing 3-4 times a week. Now that’s living near a big city (Dallas) and being willing to drive a bit more than an hour. You may have different results depending on your situation. I always forget this part but once you have a new job you might want to change your status on all of the sites you’re on. You will still probably get a bunch of calls over the next month or two but it’s nice to limit it as much as possible. Finding a new job is a JOB. Attitude is everything, and if you work hard at it you will dramatically increase your chances of finding that new job! I would offer two other pieces of insight: Show in your cover letter how you qualify for the position by describing your experience with each of the position requirements. I would also join whatever user groups are in your local as they are a great source of info on the job market. I don’t know much about constructing a good cover letter but http://baumancreative.com/ has a bunch of good blog posts on the subject. I absolutely agree about the user groups. Networking in any form is helpful and user groups even more so.